Lindsay Lohan Is A Felon! While we were tucked nicely in our beds during the wee hours of this morning, Lindsay Lohan was driving the streets of Santa Monica chasing her (newly) ex-assistant’s mom. Lindsay takes someone’s SUV and chases her assistant’s mom. The mom doesn’t know its Lindsay and calls the police. Police respond to a call of one car chasing another. They discover the chaser is Lindsay Lohan, with two male passengers in the car. 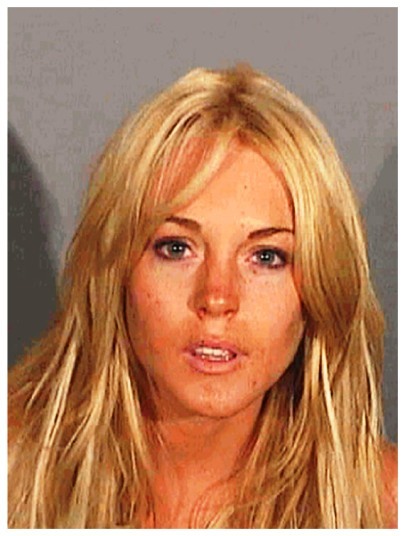 Lindsay fails a field sobriety test – blowing between a .12 and .13 (the legal limit in California is .08). Lindsay is taken into custody. At the police station, she is discovered to have cocaine in her pants pocket. She’s booked on charges of DUI, driving on a suspended license, possession of cocaine, and transporting a narcotic into a custodial facility. Lindsay Lohan checks into rehab for the third time in as many months. So if Paris went to jail for all the same reasons – minus the cocaine – then Lindsay should for sure be thrown into the slammer. It’s high time these stupid rich @@@@@es stop getting away with things. Seriously! previous post: Drew Carey! Come On Down! next post: Anna Nicole Smith And Chloral Hydrate. One Woman’s Theory. Relapse??? Lindsay’s lawyer calls this a relapse? How can Lindsay have a relapse when she hasn’t ever shown herself to be clean and sober? Ugh! I don’t believe Lindsay’s hit rock bottom. She got caught. TWICE!!! Add on the driving with a suspended license and possession of cocaine. Oh boy! Going for broke now! Denial is a coping skill. It can also be a great way to continue to self destruct. People won’t see what they don’t want to see. I don’t want anyone getting hurt, but I think Lindsay is going to have to hurt someone before she hits rock bottom. I know sometimes, that’s what it takes. 51 queries in 1.209 seconds.